The addition of crab adds a level of complexity to a household favorite and is sure to please your guests. Preheat the over to 375˚ F.
Melt butter in saucepan over medium. Add minced shallots and sauté for 1-2 minutes. Make a roux by adding the flour and cooking for about 2-3 minutes. Sauce should thicken to a paste-like texture. Slowly incorporate milk into the roux. Add seafood seasoning, sherry and cream cheese. Cook until cream cheese is fully melted. Then add Manchego, Cheddar and parsley. Cook until all cheese is fully melted. Cook pasta in salted water until just about al dente. (The pasta will continue to cook in the oven.) Drain pasta. 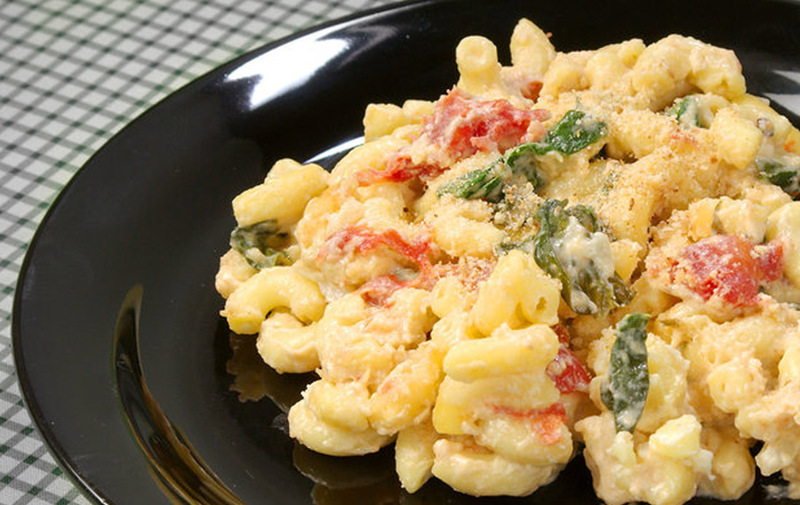 Stir cheese sauce and cooked pasta together. Fold in crab meat, delicately to preserve chunks. Pour mixture into a 9 x 13 or equivalent baking dish. To make topping, Combine melted butter, bread crumbs, seafood seasoning and parsley. Sprinkle evenly on top of pasta mixture. Bake for 15-20 minutes or until the top is golden and crispy. Garnish with fresh parsley and serve immediately.